Smart band can check your physical index, such as steps, distance, calories burned will help you get a better understanding of your fitness level. Set reminders to alert you when you have been sitting or motionless for too long. Take charge of your body today with our industry leading smart wristband! Intelligent notification be clear at a glance, convenient and timely access to telephone, SMS, and all kinds of social information. Compatible material and light weight make you can’t feel its existence nearly when you are sleeping. It can monitor your sleep time and sleep quality, record your time of deep sleep and light sleep accurately. Simple and easy to use,you can install a different clolored band any time you want. Replace different color strap to suit your mood and your outfit! 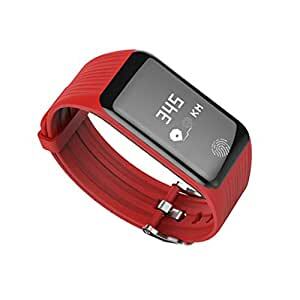 – Smart band can check your physical index, such as steps, distance, calories burned will help you get a better understanding of your fitness level. – Set reminders to alert you when you have been sitting or motionless for too long. Take charge of your body today with our industry leading smart wristband! – Intelligent notification be clear at a glance, convenient and timely access to telephone, SMS, and all kinds of social information. – Compatible material and light weight make you can’t feel its existence nearly when you are sleeping. It can monitor your sleep time and sleep quality, record your time of deep sleep and light sleep accurately. – Simple and easy to use,you can install a different clolored band any time you want. Replace different color strap to suit your mood and your outfit!